The member of South Korean idol group Super Junior, Kim Kibum, is serving as male lead in tvN Monday and Tuesday drama “I Love Lee Tae Ri“. The remarkable acting won the recognition of the audience. Recently, he shot a set of pictorials for a fashion magazine and accepted an interview, revealing his thoughts on been the male lead in a drama for the first time. Kim Kibum is playing the role of Geum Eun Dong who grew up overnight from a 14-year-old junior high school student to a 25-year-old perfect man. He stage a romantic love relationship with heiress of a chaebol, Park Ye Jin, capturing the hearts of female audience with innocent adorable charm. 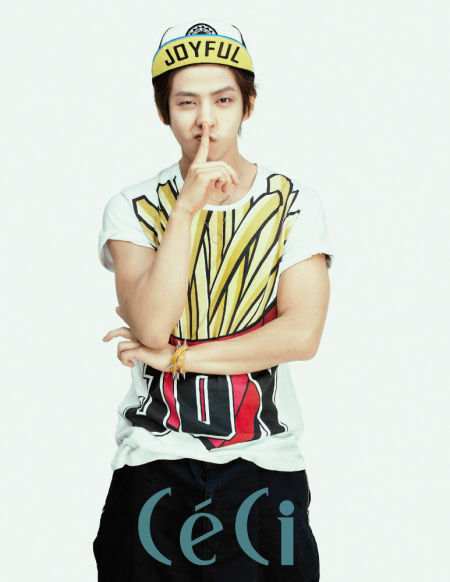 In the pictorials, Kim Kibum was wearing a hat, exposing the forehead, and appeared with only a simple T-shirt. The compact arm muscles and perfect body attracted everyone’s attention. In addition, in another picture, Kim Kibum put on a naive and romantic look, the eyes sparkled, showing another kind of charm. Finally, when asked about his feelings for starring as the lead male actor for the first time, Kim Kibum said, "Feeling anxious on whether I can play it well, but when filming the drama 'A Tree with Deep Roots', I learned a lot from senior Han Suk Kyu. Although it's very hard to film overnight, but the thought of 'I am currently acting' gave me impetus again." In addition, "I Love Lee Tae Ri" airs every Monday and Tuesday night at 11pm.